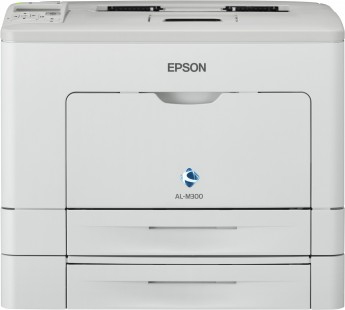 The Epson Workforce AL-M300DTN is a reliable monochrome laser printer. This printer will particularly suit a small workplace that is looking to improve productivity at an affordable price. The quality of the printing is very high, and with high-yield toners and a large paper capacity, it allows businesses to concentrate on work without frequent disruptions. However, before buying this printer, it is important to consider the printing needs of the workplace. This device is unable to print in colour, copy or scan, so if these operations are even occasionally necessary, it may mean that it’s necessary to purchase an additional machine, which requires further investment and space. The dimensions of the Epson M3000DTN are 530mm (W) x 504mm (D) x 502mm. It will connect to a computer via an Ethernet and to PCs, laptops and smart devices via Wi-Fi and the Epson mobile printing app. The monthly maximum duty is 100,000 pages. Three paper trays give it a standard paper input of 550 sheets and an output capacity of 150 pages. The status and printer options are displayed on a LCD screen. It prints at up to 35 ppm. The mobile printing app Epson iprint allows this printer to connect with multiple smart devices. It prints to a high standard with a resolution of 1,200dpi. The compact footprint is ideal for premises where space is at a premium. The 550-sheet paper capacity and high yield help to improve workplace efficiency without frequent distractions. The Epson AL-M300DTN is a monochrome printer. A workplace that needs even occasionally to print in colour would need to purchase an additional printer. There is no capacity for scanning and copying. Again, an additional machine may need to be purchased, which may be a problem for businesses where space and money are an issue.